This constant stream of criticism of the various financial methodologies out there serves to decrease the number of adherents to any particular approach to investing and trading, which in turn assures that methods with an edge actually keep that edge. Hence, criticism of the Elliott Wave Theory is always to be welcomed. I have no need at all to defend the theory, or to go into longer and deeper discussions about why the critics are wrong – because if I revealed the inner workings of my extensions to EWT which I rather non-creatively call “Extended EWT”, I’d give away valuable insights into the markets, thus serving to decrease the validity of my work. This is also the reason why this analysis service – EWT Investing – you are visiting right now, has a fixed maximum number of subscribers. Not only am I not interested in telling anyone exactly how the Extended EWT works, my analysis conclusions must also be limited in distribution. Here’s my personal YoY portfolio development, in the picture below. 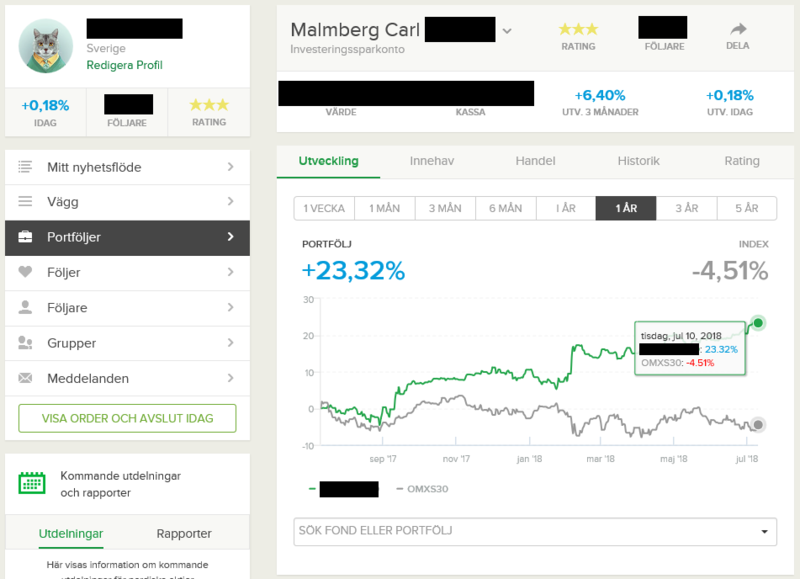 The screenshot is taken from the Swedish site Shareville.se, which is a social trading platform connected to (only) real accounts traded with real money at the brokerage-&-bank Nordnet (www.nordnet.se). I’ve redacted some fields to preserve my personal information, plus my follower count and user name on Shareville. The reasons for this is partly privacy, but I also don’t want people to find and follow my trading on Shareville.se, for efficiency reasons. As is evident from the screenshot, between 2017-07-10 and 2018-07-10 my portfolio has increased by +23.32%. During that same time, the Swedish index OMXS30 (the equivalent of Dow Jones 30 Industrial Average) has returned -4.51%. In other words, I’ve outperformed OMXS30 by +27.83% during the specified time period. Rather than defending the Elliott Wave Theory, I’m simply going to point to the above outperformance and let the reader draw his/her own conclusions. Signing up to the Global Elliott Wave Coverage doesn’t guarantee you’ll get the same results as I do from my analyses. Nor does it mean I’m always correct – the Extended EWT doesn’t make any such promises. The point of this article is simply to point out that if you sign up to this analysis service, the technical analysis conclusions you’ll get access to are written by market professionals who can actually outperform the markets.